Toshiba has announced the arrival of the Toshiba Satellite P855 series laptop, which brings the company's glasses-free 3D technology to its mid-price laptops for the first time. Announced at Toshiba's 2012 Partner Summit, with TechRadar in attendance, the laptop offers a brushed aluminium finish, with Harrman Kardon speakers, the latest Intel Series CPU, Nvidia 630 GT series graphics and it also comes with a 15.6-inch screen. Toshiba has also remade its trackpad to free up some space. The trackpad is actually bigger as it does away with buttons and brings click-down technology instead. Toshiba debuted its glasses-free 3D technology back in 2011, with the launch of the Toshiba Qosmio F750 3D laptop, which trumped Asus' effort and came first to market with the technology. The laptop uses a lenticular lens sheet and 3D webcam technology which tracks your eyes, which realigns the 3D for wherever your peepers are looking. Although the Toshiba Satellite P855 series is a mid-range laptop, Tosh believes that it is powerful enough for budding movie editors and photographers. 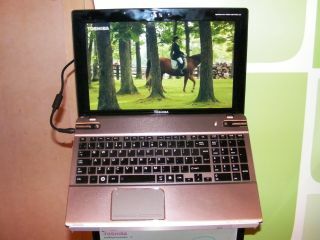 Toshiba has also announced the Toshiba Satellite P850 series, which is the same laptop but without the 3D capabilities. Price-wise, the Toshiba Satellite P855 series will be available from £599.